Most of the kids have a cartoon loving soul, regular watching of cartoon just make them addicted to their favorite cartoon characters so the kids just feel it pleasure to mimic those special cartoon characters in every aspect of living! If your kids are addicted to Mickey and Minnie cartoon heroes then presenting here this DIY pallet Mickey and Minnie chairs, would make a perfect gift to all cartoon loving kids and are just having super bewitching painted appeals! 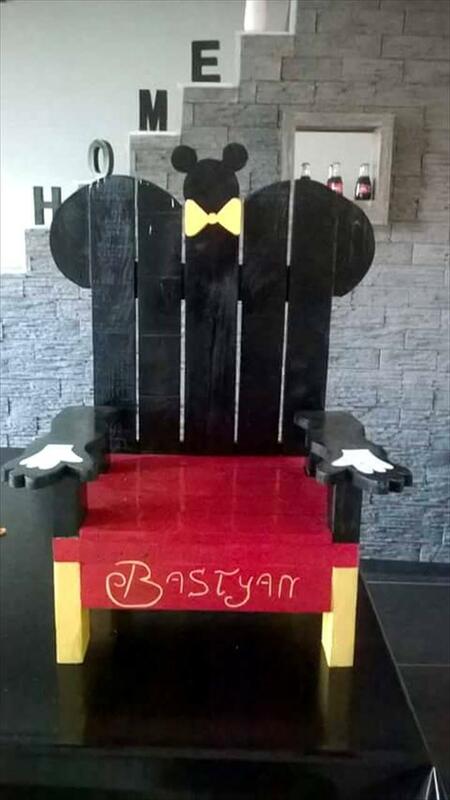 The pallet chairs gives a whole sketch of a Mickey or Minnie character, there are painted and carved hands on the armrests, there is a painted wooden bow tie mounted to backrest for an all upper body sketch and the legs are also appearing in respective colors, so entire chair model is all inspired of Mickey and Minnie costumes! The wooden composition of chairs have all been done with pallet slats and has assembly is always to done with appropriate hardware! You can also install the superman, batman, flash hero, iron man and captain America chairs for your kids using free pallets! Kids just like the cartoons and live always in their imaginations to live like those cartoons! 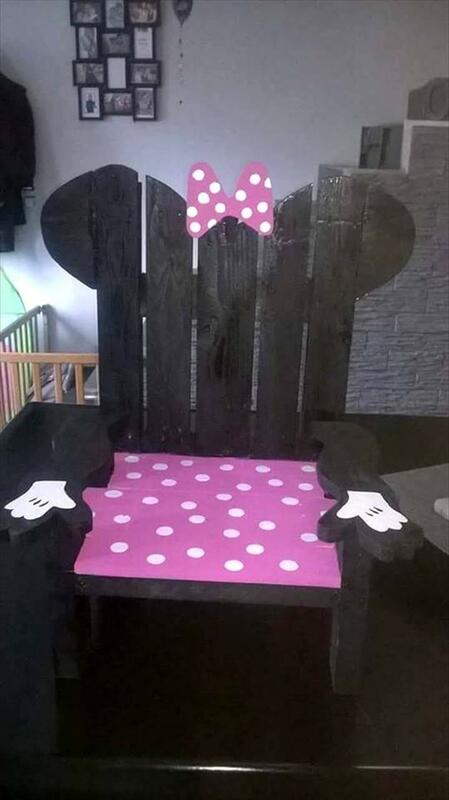 You can just make the kids dreams come true by doing a little handy work on pallets, presenting there this colorful chair inspired of cartoon character Mickey and would held all precious to cartoon loving eyes of the kids! 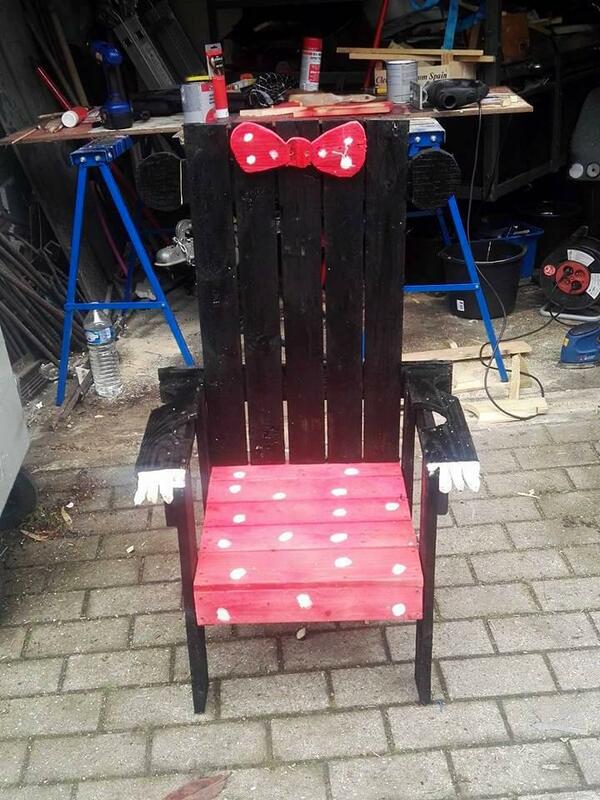 Entire chair design mimic the whole body parts of that particular cartoon character Mickey, the armrest have been made look like arms, red painted berth is the lower body, painted legs are feet and backrest depicts the face of the Mickey! For hands and fingers making, the sharp wood cutting tools have been used and there is also a neck bow tie accent made of pallet wood and painted in respective colors! This chair is truly a piece you can get for a kids fun-boost!